In this excerpt from David Quammen’s “The Tangled Tree,” meet the people who saw that evolution is more complex than you’d think. The following is an excerpt of The Tangled Tree: A Radical New History of Life by David Quammen. Life in the universe, as far as we know, and no matter how vividly we may imagine otherwise, is a peculiar phenomenon confined to planet Earth. There’s plenty of speculation and probabilistic noodling, but zero evidence, to the contrary. The mathematical odds and chemical circumstances do seem to suggest that life should exist elsewhere. But the reality of such alternate life, if any, is so far unavailable for inspection. It’s a guess, whereas earthly life is fact. Some astounding discovery of extraterrestrial beings, announced tomorrow, or next year, or long after your time and mine, may disprove this impression of Earth’s uniqueness. For now, though, it’s what we have: life is a story that has unfolded here only, on a relatively small sphere of rock in an inconspicuous corner of one middling galaxy. It’s a story that, to the best of our knowledge, has occurred just once. The shape of this story, in its broad outlines as well as its finer details, is therefore a matter of some interest. What happened, over the course of of roughly four billion years, to bring life from its primordial origins into the fluorescence of diversity and complexity we see now? How did it happen? By what concatenation of accident and determination did it yield creatures so wondrous as humans—and blue whales, and tyrannosaurs, and giant sequoias? We know there have been crucial transitions in evolutionary history, improbable incidents of convergence, dead ends, mass extinctions, big events, and little ones with big consequences—including some fateful contingencies that have left behind evidence of their occurrence embedded subtly throughout the fossil record and the living world. Alter those few contingencies, as a thought experiment, and everything would be different. We wouldn’t exist. Animals and plants wouldn’t exist. Why did it happen as it did, and not some other way? Religions have their responses to such questions, but for science, the answers must be discovered and then supported with empirical evidence, not received in a holy trance. This book is about a new method of deducing it, and certain unexpected insights that have flowed from the new method. The method has a name: molecular phylogenetics. Wrinkle your nose at that fancy phrase, if you will, and I’ll wrinkle with you, but, in fact, what it means is fairly simple: reading the deep history of life and the patterns of relatedness from the sequence of constituent units in certain long molecules, as those molecules exist today within living creatures. The molecules mainly in question are DNA, RNA, and a few select proteins. The constituent units are nucleotide bases and amino acids—more definition of those to come. The unexpected insights have fundamentally reshaped what we think we know about life’s history and the functional parts of living beings, including ourselves. In particular, there have come three big surprises about who we are—we multicellular animals, more particularly we humans—and what we are, and how life on our planet has evolved. One of those three surprises involves an anomalous form of creature, telling that story, a whole category of life, previously unsuspected and now known as the archaea. (Their name gets uppercased when used as a formal taxonomic category: Archaea.) Another is a mode of hereditary change that was also unsuspected, now called horizontal gene transfer. The third is a revelation, or anyway a strong likelihood, about our own deepest ancestry. We ourselves—we humans—probably come from creatures that, as recently as forty years ago, were unknown to exist. The discovery and identification of the archaea, which had long been mistaken for subgroups of bacteria, revealed that present-day life at the microbial scale is very different from what science had previously depicted, and that the early history of life was very different too. The recognition of horizontal gene transfer (HGT, in the alphabet soup of the experts) as a widespread phenomenon has overturned the traditional certitude that genes flow only vertically, from parents to offspring, and can’t be traded sideways across species boundaries. The latest news on archaea is that all animals, all plants, all fungi, and all other complex creatures composed of cells bearing DNA within nuclei—that list includes us—have descended from these odd, ancient microbes. Maybe. It’s a little like learning, with a jolt, that your great-great-great-grandfather came not from Lithuania but from Mars. Taken together, these three surprises raise deep new uncertainties— and carry big implications about human identity, human individuality, human health. We are not precisely who we thought we were. We are composite creatures, and our ancestry seems to arise from a dark zone of the living world, a group of creatures about which science, until recent decades, was ignorant. Evolution is trickier, far more intricate, than we had realized. The tree of life is more tangled. Genes don’t move just vertically. They can also pass laterally across species boundaries, across wider gaps, even between different kingdoms of life, and some have come sideways into our own lineage—the primate lineage—from unsuspected, nonprimate sources. It’s the genetic equivalent of a blood transfusion or (different metaphor, preferred by some scientists) an infection that transforms identity. “Infective heredity.” I’ll say more about that in its place. And meanwhile, speaking of infection: another result of this sideways gene movement involves the global medical challenge of antibioticresistant bacteria, a quiet crisis destined to become noisier. Dangerous bugs such as MRSA (methicillin-resistant Staphylococcus aureus, which kills more than eleven thousand people annually in the United States and many more thousands around the world) can abruptly acquire whole kits of drug-resistance genes, from entirely different kinds of bacteria, by horizontal gene transfer. That’s why the problem of multiple-drug-resistant superbugs—unkillable bacteria—has spread around the world so quickly. By such revelations, both practical and profound, we’re suddenly challenged to adjust our basic understandings of who we humans are, what has gone into the making of us, and how the living world works. This whole radical reset of biological thinking arose from several points of origin in space and time. One among them, maybe the most crucial, deserves mentioning here: the time was autumn 1977; the place was Urbana, Illinois, where a man named Carl Woese sat with his feet on his desk, before a blackboard filled with notes and figures, posed jauntily for a photographer from the New York Times. The accompanying Times story for which the photo was shot, announcing that Woese and his colleagues had discovered “a separate form of life” constituting a “third kingdom” of biological forms in addition to the recognized two, ran on November 3, 1977. It was front page, above the fold, shouldering aside items on the kidnapped heiress Patty Hearst and an arms embargo against the apartheid regime in South Africa. Big news, in other words, whether or not the average Times reader could grasp, from such a lean telling, just what was meant by “a separate form of life.” That article marked the apex of Woese’s fame, his Warhol moment: fifteen minutes of limelight, then back to the lab. Woese brought radical changes—to his own field, to the story of life—and yet he remains unknown to most people outside the rarefied corridors of molecular biology. Carl Woese was a complicated man—fiercely dedicated and very private—who seized upon deep questions, cobbled together ingenious techniques to pursue those questions, flouted some of the rules of scientific decorum, made enemies, ignored niceties, said what he thought, focused obsessively on his own research program to the exclusion of most other concerns, and turned up at least one or two discoveries that shook the pillars of biological thought. To his close friends, he was an easy, funny guy; caustic but wry, with a love for jazz, a taste for beer and scotch, and an amateurish facility on piano. To his grad students and postdoctoral fellows and laboratory assistants, most of them, he was a good boss and an inspirational mentor, sometimes (but not always) generous, wise, and caring. As a teacher in the narrower sense—a professor of microbiology at the University of Illinois—he was almost nonexistent as far as undergraduates were concerned. He didn’t stand before large banks of eager, clueless students, patiently explaining the ABCs of bacteria. Lecturing wasn’t his strength, or his interest, and he lacked eloquent forcefulness even when presenting his work at scientific meetings. He didn’t like meetings. He didn’t like travel. He didn’t create a joyous, collegial culture within his lab, hosting seminars and Christmas parties to be captured in group photos, as many senior scientists do. He had his chosen young friends, and some of them remember good times, laughter, beery barbecues at the Woese home, just a short walk from the university campus. But those friends were the select few who, somehow, by charm or by luck, had gotten through his shell. In later years, as he grew more widely acclaimed, receiving honors of all kinds short of the Nobel Prize, Woese seems also to have grown bitter. He considered himself an outsider. He was elected to the National Academy of Sciences, an august body, but tardily, at age sixty, and the delay annoyed him. He became, by some reports, distant from his family—a wife and two children, seldom mentioned in published accounts of his scientific labors. He was a brilliant crank, and his work triggered a drastic revision of one of the most basic concepts in biology: the idea of the tree of life, the great arboreal image of relatedness and diversification. For that reason, Woese’s moment of triumph in Urbana, on November 3, 1977, has its place near the core of this book. Other scientists and other discoveries are connected to Woese and his tree. A little-known British physician named Fred Griffith, for instance, in the mid-1920s, while researching pneumonia for the Ministry of Health, noticed an unexpected transformation among bacteria: one strain changing suddenly into another strain, presto, from harmless to deadly virulent. This was important in terms of public health (bacterial pneumonia was in those days a leading cause of death) but also, as even Griffith didn’t realize, a clue to deeper truths in pure science. The mechanism of Griffith’s perplexing transformation remained obscure until 1944, when a quiet, fastidious researcher named Oswald Avery, at the Rockefeller Institute in New York, identified the substance, the “transforming principle,” that can cause such sudden change from one bacterial identity to another. It was deoxyribonucleic acid. DNA. Less than a decade later, Joshua Lederberg and his colleagues showed that this sort of transformation, relabeled “infective heredity,” is a routine and important process in bacteria—and, as later work would show, not just in bacteria. Meanwhile, the corn geneticist Barbara McClintock, discovering genes that bounce from one point to another on the chromosomes of her favorite plant, worked with very little support or recognition through the prime years of her career—and then accepted a Nobel Prize at age eighty-one. Lynn Margul is, a Chicago-educated microbiologist unique in almost every way, shared at least one thing with McClintock: the frustrations BLUES1P_Quammen_TangledTree_KB.indd 13 6/21/18 4:06 PM xiv Three Surprises: An Introduction of being dismissed by some colleagues as an eccentric and obdurate woman. In Margulis’s case, it was for reviving an old idea that had long been considered wacky: endosymbiosis. What she meant by the term was, roughly, the cooperative integration of living creatures within living creatures. That is, not just tiny creatures within the bellies or noses of big creatures, but cells within cells. More specifically, Margulis argued that the cells constituting every creature in the more complex divisions of life—every human, every animal, every plant, every fungus—are chimerical things, assembled with captured bacteria inside nonbacterial receptacles. Those particular bacteria, over vast stretches of time, have become transmogrified into cellular organs. Imagine an oyster, transplanted into a cow, that becomes a functional bovine kidney. This seemed crazy when Margulis proposed it in 1967. But she was right about the matter, mostly. Fred Sanger, Francis Crick, Linus Pauling, Tsutomu Watanabe, and other scientists played crucial parts in this chain of events too, sometimes by force of personality as well as by scientific brilliance. Slightly deeper in the past lie obscure figures such as Ferdinand Cohn, Edward Hitchcock, and Augustin Augier, as well as more famous ones, including Ernst Haeckel, August Weismann, and Carl Linnaeus. The ghost of Jean-Baptiste Lamarck rises here again to skulk along inescapably in the shadows of evolutionary thinking. Such people, all contributors to a scientific upheaval, are of additional interest for the ways their works grew from their lives. They serve as good reminders that science itself, however precise and objective, is a human activity. It’s a way of wondering as well as a way of knowing. It’s a process, not a body of facts or laws. Like music, like poetry, like baseball, like grandmaster chess, it’s something gloriously imperfect that people do. The smudgy fingerprints of our humanness are all over it. Excerpted from The Tangled Tree by David Quammen. Published by arrangement with Simon & Schuster. 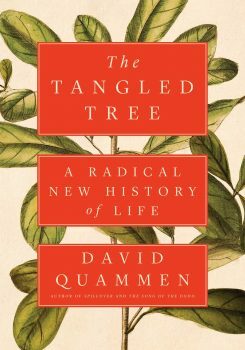 David Quammen is the author of several books, including The Tangled Tree: A Radical New History of Life (Simon & Schuster, 2018). The Song of the Dodo (Scribner, 1997) and Spillover: Animal Infections and the Next Human Pandemic (W.W. Norton & Company, 2012). He is based in Bozeman, Montana. A writer ponders his own genetics and history.